Charlie St. Cloud is a boy like no other. He has amazing talent in the field of sailing, he’s so good in fact that he has earned a scholarship from Stanford. He’s a bit of a risk taker, but keeps a grounded personality due to being the father figure to his younger brother, Sam. If there is a near perfect person in this world, all appearances point to the fact that Charlie might be it. He’s got everything, effortless good looks, a winning personality, and just about as much athletic talent as most people could hope for. On top of all this, he manages to be an excellent older brother, even to the point of promising Sam to help him with his dream of being a baseball player up until the day he leaves for Stanford. Although, this wouldn’t be much of a story if everything stayed fine and dandy, would it? Nope, things take a turn for the worse in an awful car accident that claims the life of his younger brother, and almost takes his as well. Charlie has been brought back from death, only to be left without his source of comfort, his brother. Cut to five years later, and the once promising Charlie is now heads groundskeeper for the local cemetery, and according to the townsfolk is a certifiable crazy person. This might be due to the fact that he tossed away a full ride to a prestigious university to be groundskeeper in a small Washington town. Charlie’s life isn’t what it seem though. Charlie’s foray into the light has enabled him to see the dead while they are still in the “in between”. This special gift enables him to play baseball with his younger brother every day, to continue the promise he made five years ago. When local sailor girl, Tess Carroll, comes back in town to get ready for her around the world sailing trip, things get shaken up a bit. Charlie must make a decision, to join her world could wreck the world he has built around her brother? Charlie St. Cloud is a film that seemingly begs for your tears. The film is unabashedly sentimental, and it wouldn’t be such a big deal, but it gets in the way of the story some of the time. The effort is one that is not subtle at all. Director Burr Steers even goes as far as showing an angel statue with a raindrop disguised as a tear, in what is one of the cheesiest moments in the film. Zac Efron catches a lot of flak, and it could possibly be due to the start of his stardom coming from the High School Musical series, but the actor is a serious threat in the business. He still doesn’t have control of his finer emotions on film, but he does maintain a strong screen presence which helps lift the film above its other flaws. Efron is a bona fide movie star who is around to stay, and to ignore this fact would be silly. The supporting cast have a few members who shine brightly, but none more so than Augustus Prew who plays Charlie’s “best mate”, Alistair Wooley. Prew’s performance lightens up the mood in all of his scenes, and really helps bring light to what would’ve been a very dark affair without him. Giving us passable performances are Amanda Crews and Charlie Tahan, as Tess Carroll and Sam St. Cloud respectively. Neither of them detract from the performance, but don’t really seem to add much either. Crews starts out OK, but as she falls more love struck her performance suffers. Tahan has much of the same problem, his performance starts out great, and really captures a great brotherly spirit with Efron, but his performance dwindled and becomes wooden after his character stays in the clearing. One of the most surprising aspects of the film is that Kim Bassinger and Ray Liotta, both reasonably well known actors that appear in the film, have possibly the smallest parts. Bassinger has only a handful of lines, and probably only clocks in a couple minutes of total screen time. Liotta gets a bit more, and does well with what he has to do, but don’t even pass the five minute mark. 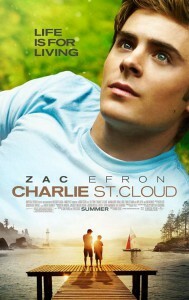 In the end, if you like a good cry, and don’t mind a bit of forced sentimentality, then Charlie St. Cloud will be a good fan. Alternately, if you worship at the altar of Efron, then you probably won’t be disappointed with this one. Member of the St. Louis Film Critics Association. Co-Founder of Saint Brewis and Review St. Louis. Digital Strategist by day, film/beer/hockey fanatic by night.